The Texas Rangers, America’s oldest state law enforcement agency, are gearing up for their landmark 200th anniversary: The Texas Ranger Bicentennial in 2023. As part of the upcoming anniversary, there will be celebrations and festivals, lectures and presentations, publications added to the Bicentennial Publications Program, fundraisers and more! We will be expanding this section with resources for event planners, interested sponsors, and information for attendees as more information becomes available so keep checking back. The Texas Rangers, America’s oldest state law enforcement agency, are gearing up for their landmark 200th anniversary. Today’s elite 150 Rangers trace their founding to 1823. The first Rangers were minutemen and scouts protecting farms, ranches and settlements on a hostile frontier. Remarkably, Rangers have upheld the law over the span of three centuries; they are the only American lawmen to have served under five flags – Mexico, the Republic of Texas, the US, Confederate Texas and the US again. 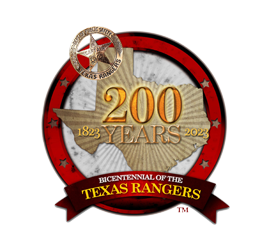 In preparation for an event of State and National significance, the Texas Public Safety Commission has appointed the Texas Ranger Hall of Fame and Museum in Waco as their representative and steward for the Bicentennial™. The museum was established as the official historical center of the Texas Rangers in 1964. The five members of the Texas Public Safety Commission are appointed by the Governor, confirmed by the Senate, and charged with oversight of the Texas Department of Public Safety including the Texas Rangers division. Over almost 50 years the Texas Ranger Hall of Fame has grown to include: a museum, Texas Ranger company headquarters, State Hall of Fame, library and archives, an educational center serving nonprofits and a banquet facility. The Texas Ranger Hall of Fame will serve as a conduit for proposals and requests for Texas DPS to sanction official Bicentennial commemorations. The staff will assist in coordinating and facilitating those activities. The Commission has also endorsed efforts to renovate and expand the exhibits and educational facilities of the Texas Ranger Hall of Fame in Waco. Their desire is to leave a Bicentennial legacy by supporting efforts of the museum to further preserve the Texas Ranger heritage for future generations. To accomplish this, the Hall of Fame and Museum Board work with benefactors and corporations as Texas Ranger Bicentennial™ partners with the goal of updating and expanding its nationally recognized facilities. The leader of this campaign is Hank Whitman, Board chairman and recently retired Chief of the Texas Rangers.